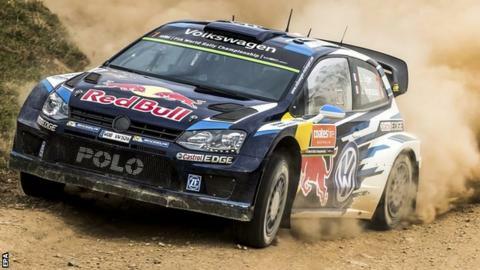 Sebastien Ogier secured his third successive World Rally Championship with victory in Rally Australia. Ogier's win in the three-day road gravel event in New South Wales was his seventh of the season as the French driver beat Volkswagen Polo R team-mate Jari-Matti Latvala by 12.3 seconds. The 31-year-old said: "It's an amazing season, the best I've ever done." Ogier joins Sebastien Loeb (nine), Juha Kankkunen and Tommi Makinen (both four) in winning three or more world titles. Volkswagen's 1-2 in Australia secured a third manufacturers' crown for the German team. Ogier won the final seven speed tests to take victory in Australia, overhauling Northern Ireland's Kris Meeke, who had led on the second day before going on to finish third, more than half a minute behind the winner. The 11th round of the championship takes place in France from 1-4 October with the 13th and final round, the Wales GB Rally, being staged from 12-15 November.